The game is afoot. Israel, believe it or not, is demanding that seven Arab countries and Iran pay $250 billion in compensation for what it claims was the forceful exodus of Jews from these nations during the late 1940s. The events Israel is citing allegedly occurred at a time when Zionist Jewish militias were actively uprooting nearly 1 million Palestinian Arabs and systematically destroying their homes, villages and towns throughout Palestine. The Israeli announcement, which reportedly followed “18 months of secret research,” should not be filed under the ever-expanding folder of shameless Israeli misrepresentations of history. It is part of a calculated effort by the Israeli government, and specifically by Minister for Social Equality Gila Gamliel, to create a counter-narrative to the rightful demand for the “right of return” for Palestinian refugees ethnically cleansed by Jewish militias between 1947 and 1948. But there is a reason for the Israeli urgency to reveal such questionable research: The relentless US-Israeli attempts of the last two years to dismiss the rights of Palestinian refugees, to question their numbers and to marginalize their grievances. It is all part and parcel of the ongoing plot disguised as the “deal of the century,” with the clear aim of removing from the table all major issues that are central to the Palestinian struggle for freedom. The language — “to correct the historic injustice” — is no different from that used by Palestinians, who have for 70 years and counting been demanding the restoration of their rights as per UN General Assembly Resolution 194. The deliberate conflating of the Palestinian narrative with the Zionist narrative is aimed at creating parallels in the hope that a future political agreement would see both grievances cancel each other out. Contrary to what Israeli historians want us to believe, there was no mass exodus of Jews from Arab countries and Iran, but rather a massive campaign orchestrated by Zionist leaders of the time to replace the Palestine Arab population with Jewish immigrants from all over the world. To hold Arabs and Iran responsible for this bizarre and irresponsible behavior is a transgression on the true story, in which neither Gamliel nor her ministry are interested. On the other hand, and unlike what Israeli military historians often claim, the events in Palestine in 1947-48 (and the purges of the native population that followed in 1967) were a premeditated act of ethnic cleansing. They were part of a drawn-out and carefully calculated campaign that, from the very start, served as the main strategy at the heart of the Zionist movement’s “vision” for the Palestinian people. “We must expel the Arabs and take their place,” wrote Israel’s founder, military leader and first prime minister David Ben-Gurion in a letter to his son Amos in 1937. That was over a decade before Plan D, which saw the destruction of the Palestinian homeland at the hands of Ben-Gurion’s militias, came into effect. Palestine “contains vast colonization potential,” he also wrote, “which the Arabs neither need nor are qualified to exploit.” This clear declaration of a colonial project in Palestine, communicated with the same kind of unmistakable racist insinuations and language that accompanied all Western colonial experiences throughout the centuries, was not unique to Ben-Gurion. He was merely paraphrasing what was, by then, understood to be the crux of the Zionist enterprise in Palestine at the time. As Palestinian professor Nur Masalha concluded in his book, “Expulsion of the Palestinians,” the idea of the “transfer” — the Zionist term for ethnic cleansing of the Palestinian people — was, and remains, fundamental in the realization of Zionist ambitions in Palestine. For Israel to be seeking compensation from Arab countries and Iran is a moral travesty, especially as Palestinian refugees continue to languish in camps across Palestine and the Middle East. This tragedy eventually grew to affect all Palestinians throughout their historic homeland. Tens of thousands of refugees joined up with hundreds of thousands more on various dusty trails throughout the country, growing in numbers as they walked further, before finally pitching their tents in areas that were then meant to be “temporary” encampments. 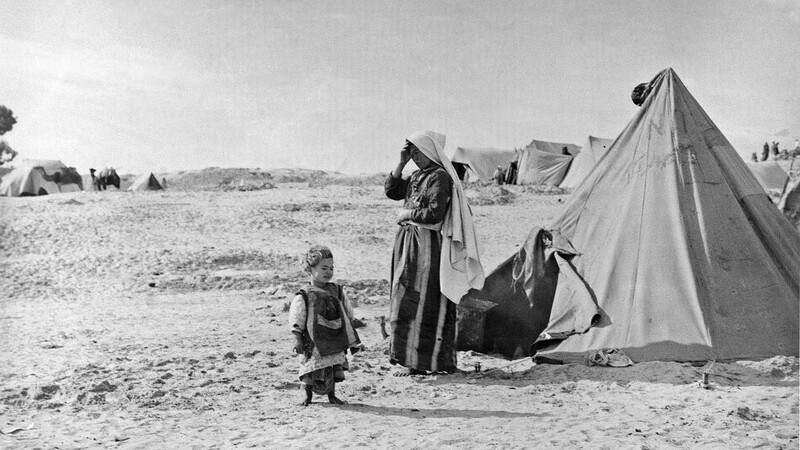 Alas, these became the Palestinian refugee camps of today. None of this was accidental. The determination of the early Zionists to establish a “national home” for Jews at the expense of the country’s Palestinian Arab population was communicated openly, clearly and repeatedly throughout the formation of early Zionist thought, and the translation of those well-articulated ideas into physical reality. Seventy years have passed since the Nakba — the catastrophe of 1948 — and neither has Israel taken responsibility for its actions nor have Palestinian refugees received any measure of justice, however small or symbolic. Indeed “the time has come to correct the historic injustice” — not of Israel’s alleged pogroms carried out by Arabs and Iranians, but the real and most tragic destruction of Palestine and its people.